BSEB has been declared the date of examination for the students of intermediate. Wait got over for the date of Bihar Board 2018 12th exam, BSEB XIIth Exam Program 2018, Bihar Board 2018 Inter examination Program/timetable. As lot’s of students from the Bihar asked When the Bihar Board ISC exam 2018 start. Below we have provided the completed details of Bihar Board 2018 Examination routine of Class 12th for Science/ Arts and Commerce Stream students. Now students need to prepare Board Exam of BSEB 12th Class in a good way because there is only some month left for begin BSEB 2018 Annual Exam of 12th Class. Below is a full list of Intermediate Exam Bihar board Time Table with Routine. Chairperson of Bihar School Examination Board, Patna has been announced the Program for intermediate (+2) Sci, Arts, Com. & Voc course Main (Annual) Examination 2018. As per Dainik Jagran Hindi Newspaper, Patna Edition BSEB Intermediate Annual Exam 2018 is going to start from the 06/02/2018 to 16/02/2018. On this page, we have provided the completed details of BSEB XIIth SCI/ARTS/COM & Voc Corse Annual exam 2018 Program. Some of the IMP instruction of BSEB 2018 inter exam Program. A “Cool off” time of additional 15 minutes has been given above to the examinee He/She has to use the “Cool off” time for reading and analyzing the question and to plan the answers accordingly. He/She is not supposed to write answer of any question during the “Cool off” time. 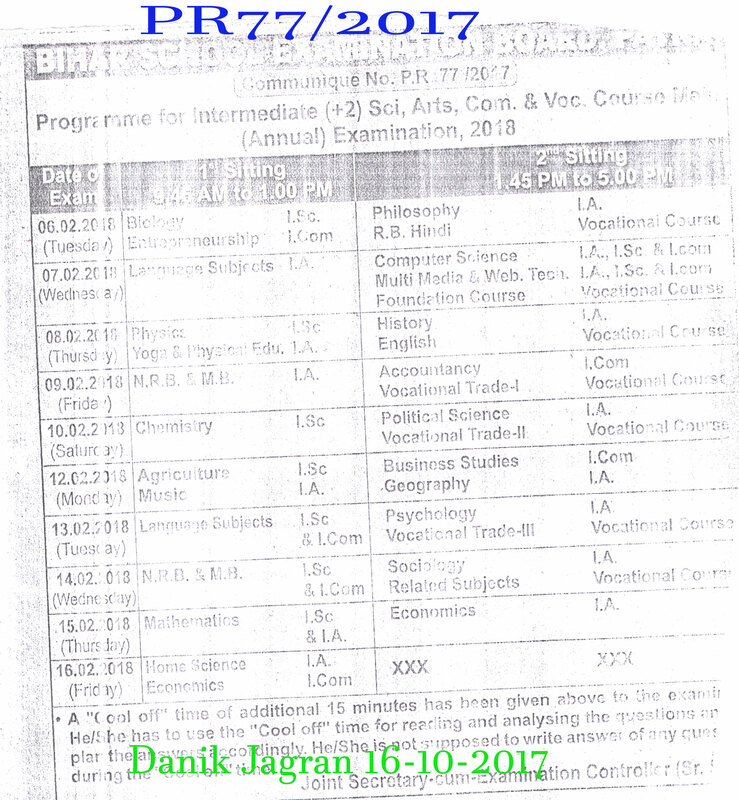 Exam program of Bihar Board 2018 main +2 (Intermediate) Annual exam is announced on the 15/10/2017 at Patna by Shri A Kishor (Chairperson BSEB) as per Danik Bhaskar – It is confirmed by PR 77/2017.